Back in 1987, South African President Cyril Ramaphosa – then a 34-year-old labor union leader – led 300,000 black miners in a strike that symbolised resistance to the apartheid regime. Now, striking gold workers face a less politically charged battle, but one they can’t win. The nation’s 130-year-old gold industry – which has produced half the bullion ever mined on Earth – is locked in the final stages of a decades-long death spiral. 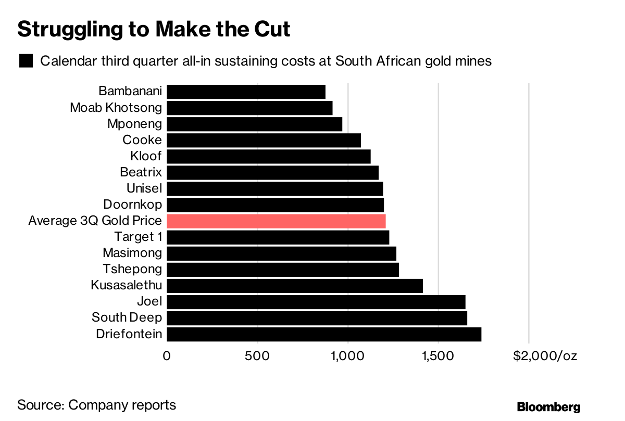 Most of South Africa’s gold mines are unprofitable at current prices. 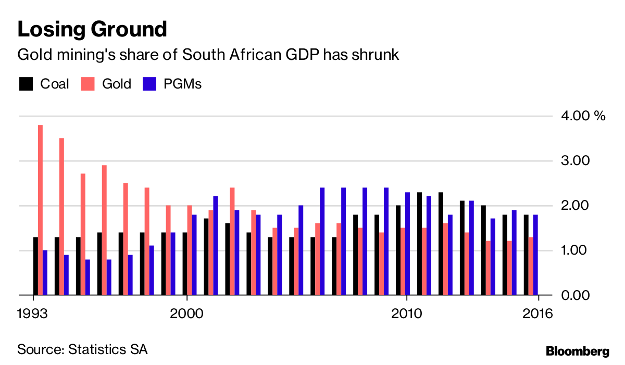 Dwindling output has cut gold’s contribution to little more than 1% of the South African economy, down from 3.8% in 1993 – the year before Nelson Mandela’s African National Congress won the country’s first democratic elections. While the industry’s demise won’t reverberate in the way it once would have, the mines minister has criticised Gold Fields’ plan to cut jobs as the ruling ANC seeks to shore up its base before elections next year. Mines run by Gold Fields and Sibanye Gold have been halted by strikes over job cuts and wages respectively. Both producers cut their output projections for this year. 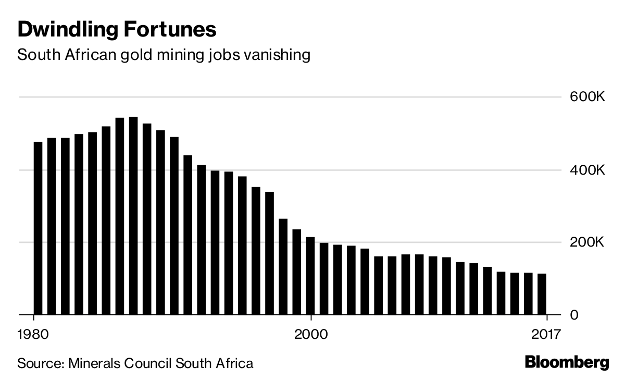 South Africa’s gold industry now employs just over 100 000 people, less than a fifth of the number that used to power the apartheid economy. The economic and social impact of a further contraction in the industry will be magnified as every gold miner supports between five and 10 dependents, while creating two jobs elsewhere, according to the country’s Minerals Council. Higher wages and power prices, combined with the geological challenges of the world’s deepest mines, will mean more job losses and less production in the country over the next five years, said Gold Fields Chief Executive Officer Nick Holland. Sibanye, the country’s biggest producer, faces wage strikes at three of its mines. CEO Neal Froneman acknowledges that pressure is building on the miner to resolve its safety problems after more than 20 fatalities this year. If that can be done, he’s optimistic that South Africa’s gold mines can survive a little longer.